When it comes to designing of the interior of any room in the house whether you are building a new one or renovating, considering the storage areas is one of the most crucial things that you need to contemplate. In the modern houses of the current era, efficient designs to maximise storage space are popularly being adapted by people. One of the most popular storage solutions is the modern sliding door wardrobe which you can use not only as the appealing interior feature but also maximise the storage space in your room in an elegant manner. One of the main reasons why fitted sliding door wardrobe is a preferred option for modern homes is because it is a great way of saving space. 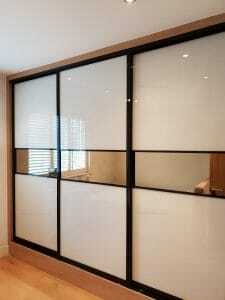 You will not have to lose space on the floor for the hinged doors. It is also a great option if you need to add a stylish yet convenient primary or secondary closet to store your garments in a bedroom or any other room at your house. Nowadays, bespoke mirror wardrobe are quite popular and can be seen in various modern houses and flats, hotels, offices and restaurants. Not only do they look stylish but they are efficient as well because in addition to providing a good storage space, they have mirrored sliding panels. So, instead of having to buy mirrors in the room which might take more space, you can just build a fitted wardrobe in one of the walls of the bedroom which has mirrored sliding panels. This saves ample floor area in the room. These bespoke mirror wardrobes are also great because the mirrored sliding panels on them also create an illusion effect to make the room look more spacious and lighter than it really is. The current trend in modern house building and renovation is to build smaller rooms but utilise every square inch of space in them. Made-to-measure built-in wardrobes are more popular that the ready-to-buy ones because they are practical, efficient and fantastic for any room. You can store away all your belongings in these wardrobes including clothes, shoes, toys, kitchen supplies, etc. Literally anything can be conveniently stored away. They are available in various styles and sizes as well as made of various materials. From the bedroom to the kids’ playroom and from the living room to the laundry room, modern sliding door wardrobe can be a great storage solution for your home.